Universities have a unique role to play in making health and wellbeing provision more efficient and responsive to local populations, so people can lead happy, healthy lives, a new research report by University Alliance finds. 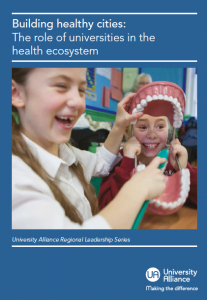 The study, Building healthy cities: The role of universities in the health ecosystem is the first of its kind examining the ways in which universities as anchor institutions relate to regional health ecosystems. It argues they are uniquely placed to integrate the complex web of organisations that make up a local health economy. Reflecting on both the financial pressures facing the NHS and the government’s agenda of devolving more powers and budgets to city regions, University Alliance examined local practice in Bristol as a model for how different bodies and agencies can work together to deliver better outcomes and make a real difference to those living in the community. This comes after a recent report by the Communities and Local Government Select Committee which highlighted the need for a clearer articulation on how health devolution can work in local settings. Building healthy cities outlines the increasing contribution universities are making to building healthier cities and regions and tackling public health challenges through research-informed policy and practice in areas such as built environment, planning and community health. A key element of this contribution is the role universities have in training and educating the health workforce of the future. Following extensive reforms announced in the 2015 Spending Review to remove the student numbers cap in nursing, midwifery and allied health education in England, the report recommends that ministers must ensure there continues to be adequate workforce planning, so universities can continue to recruit effectively to reflect forecast needs. The report also urges the government to monitor the impact of its plan to move non-medical students off NHS grants and onto the student loan system, and intervene in future if necessary. 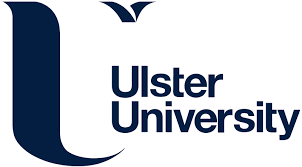 It warns that, given nursing students are often mature entrants or from disadvantaged backgrounds, many could be put off applying by the prospect of loan debt and a less diverse applicant pool would undermine the government’s widening participation targets. At the same time, the high standards of admission for nurses and allied health professionals must be upheld. The report is the first in a series of University Alliance publications this year, focusing on the leadership role of universities as anchor institutions in cities and regions, working within wider ecosystems and responding to common real-world challenges in an enterprising, innovative and creative way. “University Alliance universities are committed to their cities and regions. This makes us essential partners for decision makers as powers and budgets are increasingly devolved down. “One area where universities can make the difference is in building healthy cities – by training the health workforce, helping to co-ordinate agencies regionally and contributing to better outcomes through research. Bristol Health Partners, a strategic partnership which brings together universities, NHS trusts, commissioning groups and City authorities, to ensure local priorities reflect local needs, in a way that a more distant funding body with its own agenda could not, including a focus on specific challenges such as dementia and self-harm. UWE’s World Health Organisation Collaborating Centre for Healthy Urban Environments, which promotes evidence-based policy and practice to develop healthy neighbourhoods, working with local authorities and business to integrate health and wellbeing considerations into decision making. The West of England Academic Health Science Network: Chaired by the Vice Chancellor of UWE, the network has mapped out the region’s health and life sciences sector and brought academics, health practitioners, the life sciences sector, NHS bodies and the public together to improve patient care and outcomes. Communities and Local Government Select Committee report, Devolution: The next five years and beyond, published 25 January 2016. You can read more of our case studies from Alliance universities here.